This is pattern for a large tiger that is holding a large pumpkin. This is a request from a former co-worker that has requested many other items from me in the past. 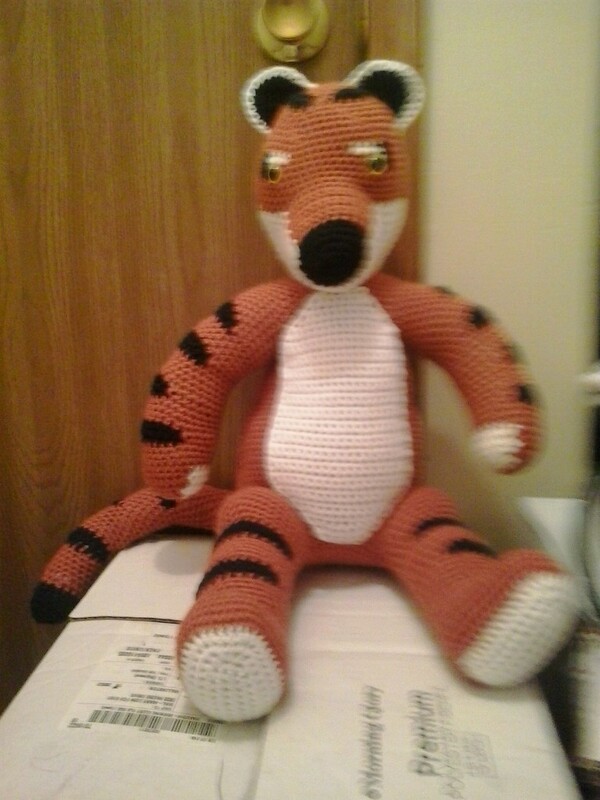 Most of the parts of the pattern came from a pattern that I have for Tigger from Winnie the Pooh. The concept of the project was a large tiger holding a pumpkin. My co-worker explained the reasoning behind the project was that her deceased husband was a big man. His name was Tony and his nickname were “Tony the Tiger.” He always called his wife, my co-worker, “pumpkin.” So, Large tiger holding his pumpkin. It was a touching piece that I was honored to make for her. The pattern for the pumpkin will be posted soon. Worsted Weight Yarn: Burnt pumpkin, white, and black. Rd 11: sc in next sc, change to black, slip st in next sc, sc in next 10 sc, slip st in next sc, turn, skip next slip st, sc in next 10 sc, slip st in next slip st, turn, skip next slip st, sc in next 10 sc, slip st in next slip changing to burnt pumpkin, sc in next 11 sc. Rd 16: sc in next 4 sc, change to black, slip st in next sc, sc in next 6 sc, slip st in next sc, turn, skip next slip st, sc in next 6 sc, slip st in next slip st, turn, skip next slip st, sc in next 6 sc, slip st in next slip changing to burnt pumpkin, sc in next 12 sc. Rd 21: sc in next 4 sc, change to black, slip st in next sc, sc in next 10 sc, slip st in next sc, turn, skip next slip st, sc in next 10 sc, slip st in next slip st, turn, skip next slip st, sc in next 10 sc, slip st in next slip changing to burnt pumpkin, sc in next 8 sc. Rd 26: sc in next 8 sc, change to black, slip st in next sc, sc in next 6 sc, slip st in next sc, turn, skip next slip st, sc in next 6 sc, slip st in next slip st, turn, skip next slip st, sc in next 6 sc, slip st in next slip changing to burnt pumpkin, sc in next 8 sc. Rd 33: sc in each sc around placing a marker around sc #7. Rds 4-5: sc in each sc around. (16) Change to burnt pumpkin after Rd 5. Rd 13: sc in next 3 sc, change to black, slip st in next sc, sc in next 8 sc, slip st in next sc, turn, skip next slip st, sc in next 8 sc, slip st in next slip st, turn, skip next slip st, sc in next 8 sc, slip st in next slip changing to burnt pumpkin, sc in next 3 sc. Rds 14-19: sc in each st around. (16) Change to black after Rd 19. Rd 20: slip st in next sc, sc in next 8 sc, slip st in next sc, turn, skip next slip st, sc in next 8 sc, slip st in next slip st, turn, skip next slip st, sc in next 8 sc, slip st in next slip changing to burnt pumpkin, sc in next 6 sc. Rd 27: sc in next 6 sc, change to black, slip st in next sc, sc in next 8 sc, slip st in next sc, turn, skip next slip st, sc in next 8 sc, slip st in next slip st, turn, skip next slip st, sc in next 8 sc, slip st in next slip changing to burnt pumpkin. Rd 34: sc in next 3 sc, change to black, slip st in next sc, sc in next 8 sc, slip st in next sc, turn, skip next slip st, sc in next 8 sc, slip st in next slip st, turn, skip next slip st, sc in next 8 sc, slip st in next slip changing to burnt pumpkin, sc in next 3 sc. Rds35-40: sc in each st around. (16) Change to black after Rd 40. Rd 41: slip st in next sc, sc in next 8 sc, slip st in next sc, turn, skip next slip st, sc in next 8 sc, slip st in next slip st, turn, skip next slip st, sc in next 8 sc, slip st in next slip changing to burnt pumpkin, sc in next 6 sc. Finish off. Weave in ends. Stuff TAIL firmly. Rd 5: Ch 1, turn; sc in next 12 sc, 2 sc in next 2 sc, sc in next 3 sc, 2 sc in next 2 sc, sc in next 12 sc. (35) Change to burnt pumpkin. Rd 20: sc in next 8 sc, change to black, slip st in next sc, sc in next 10 sc, slip st in next sc, turn, skip next slip st, sc in next 10 sc, slip st in next slip st, turn, skip next slip st, sc in next 10 sc, slip st in next slip changing to burnt pumpkin, sc in next 7 sc. Rd 27: sc in next 8 sc, change to black, slip st in next sc, sc in next 14 sc, slip st in next sc, turn, skip next slip st, sc in next 14 sc, slip st in next slip st, turn, skip next slip st, sc in next 14 sc, slip st in next slip changing to burnt pumpkin, sc in next 3 sc. Finish off. Weave in ends. Stuff FIRST LEG firmly. Rd 8: sc in next 5 sc, fold TAIL in half, holding next sc on BODY and first 2 sc on folded TAIL together and working through all thicknesses, sc in next 8 sc, sc in next 15 sc, holding next sc on BODY and marked sc on first LEG together and working through both thicknesses, sc in next 5 sc, leave remaining 28 sc on LEG unworked, sc in next 10 sc on BODY, holding next sc on BODY and marked sc on second LEG together and working through both thicknesses, sc in next 5 sc, leave remaining 28 sc on LEG unworked, sc in next 10 sc on BODY. Rd 21: sc in next 32 sc, slip st in next sc, turn, skip next slip st, sc in next 36 sc, slip st in next slip st, turn; sc in next 36 sc, slip st in next slip st changing to burnt pumpkin, sc in next 43 sts. Rd 29: sc in next 15 sc, sc2tog, sc in next 15 sc, (sc2tog) twice, sc in next 11 sc, sc2tog, sc in next 10 sc, sc2tog, sc in next 11 sc, (sc2tog) twice. (69) Change to black. Rd 43: sc2tog, sc in next 11 sc, sc2tog, sc in same sc as first joining sc of ARM, sc in next 12 unworked sc on ARM, sc in same sc as last joining sc of ARM, sc2tog in BODY, sc in next 9 sc, sc2tog, sc in same sc as first joining sc of ARM, sc in next 12 unworked sc on ARM, sc in same sc as last joining of ARM. Rd 46: sc2tog, sc in next 5 sc, (sc2tog) twice, sc in next 10 sc, sc2tog, sc in next 7 sc, sc2tog, sc in next 10 sc, sc2tog. (38) Change to black. Rd 48: sc in next 8 sts, (sc2tog) twice, sc in next 4 sc, (sc2tog) twice, sc in next sc, (sc2tog) twice, sc in next 4 sc, (sc2tog) twice. (25) Change to white. Rd 50: sc in next 2 sc, 2 sc in next sc, sc in next 8 sc, 2 sc in next sc, sc in next 5 sc, 2 sc in next sc, holding next sc on BODY and marked sc on MUZZLE together and working through both thicknesses, sc in next 7 sc, leave remaining 29 sc on MUZZLE unworked, 2 sc in next sc on BODY, sc in next 3 sc. Rd 51: sc in next 7 sc, 2 sc in next sc, sc in next 8 sc, 2 sc in next sc, sc in next 3 sc, sc together next sc on BODY and next unworked sc on MUZZLE, working in sc behind MUZZLE, sc in next sc, ch 5, skip next 5 sc, sc in next sc, skip next 27 sc on MUZZLE, sc together next sc on MUZZLE and next sc on BODY, sc in next 3 sc, 2 sc in next sc. Rd 52: sc in next 8 sc, 2 sc in next sc, sc in next 9 sc, 2 sc in next sc, sc in next 3 sc, sc together next sc on BODY and next skipped sc on MUZZLE, working in sc behind MUZZLE, sc in next sc, ch 6, sc in next sc, skip next 25 sc on MUZZLE, sc together next sc on MUZZLE and next sc on BODY, sc in next 3 sc, 2 sc in next sc, sc in next sc. Rd 53: sc in next 9 sc, 2 sc in next sc, sc in next 10 sc, 2 sc in next sc, sc in next 3 sc, sc together next sc on BODY and next skipped sc on MUZZLE, working in sc behind MUZZLE, sc in next sc, ch 7, sc in next sc, skip next 23 sc on MUZZLE, sc together next sc on MUZZLE and next sc on BODY, sc in next 3 sc, 2 sc in next sc, sc in next 2 sc. Rd 54: sc in next 10 sc, 2 sc in next sc, sc in next 11 sc, 2 sc in next sc, sc in next 3 sc, sc together next sc on BODY and next skipped sc on MUZZLE, working in sc behind MUZZLE, sc in next sc, ch 9, sc in next sc, skip next 21 sc on MUZZLE, sc together next sc on MUZZLE and next sc on BODY, sc in next 3 sc, 2 sc in next sc, sc in next 3 sc. Rd 55: sc in next 10 sc, 2 sc in next sc, sc in next 13 sc, 2 sc in next sc, sc in next 3 sc, sc together next sc on BODY and next skipped sc on MUZZLE, working in sc behind MUZZLE, sc in next sc, ch 10, sc in next sc, skip next 19 sc on MUZZLE, sc together next sc on MUZZLE and next sc on BODY, sc in next 3 sc, 2 sc in next sc, sc in next 4 sc. Rd 56: sc in next 10 sc, 2 sc in next sc, sc in next 15 sc, 2 sc in next sc, sc in next 3 sc, sc together next sc on BODY and next skipped sc on MUZZLE, working in sc behind MUZZLE, sc in next sc, ch 11, sc in next sc, skip next 17 sc on MUZZLE, sc together next sc on MUZZLE and next sc on BODY, sc in next 3 sc, 2 sc in next sc, sc in next 5 sc. Rd 57: sc in next 10 sc, 2 sc in next sc, sc in next 17 sc, 2 sc in next sc, sc in next 3 sc, sc together next sc on BODY and next skipped sc on MUZZLE, working in sc behind MUZZLE, sc in next sc, ch 11, sc in next sc, skip next 15 sc on MUZZLE, sc together next sc on MUZZLE and next sc on BODY, sc in next 3 sc, 2 sc in next sc, sc in next 6 sc. Rd 58: sc in next 34 sc, sc together next sc on BODY and next skipped on MUZZLE, working in sc behind MUZZLE, sc in next sc, ch 11, sc in next sc, skip next 13 sc on MUZZLE, sc together next sc on MUZZLE and next sc on BODY, sc in next 11 sc. Rd 59: sc in next 23 sc, change to burnt pumpkin, sc in next 12 sc, sc in next skipped sc on MUZZLE, working in sc behind MUZZLE, sc in next sc, ch 9, sc in next sc, skip next 11 sc on MUZZLE, sc in next sc, sc in next 12 sc on BODY. Rd 60: sc in next 2 sc, changing to white, sc in next 19 sc, change to burnt pumpkin, sc in next 15 sc, sc in next skipped sc on MUZZLE, working in sc behind MUZZLE, sc in next sc, ch 7, sc in next sc, skip next 9 sc on MUZZLE, sc in next sc, sc in next 13 sc on BODY. Rd 61: sc in next 2 sc, change to black, slip st in next sc, sc in next 17 sc, slip st in next sc, turn, skip next slip st, sc in next 17 sc, slip st in next slip st, turn, skip next slip st, sc in next 17 sc, slip st in next slip st changing to burnt pumpkin, sc in next 16 sc, sc in next 9 sc on MUZZLE, sc in next 14 sc. Finish off leaving a long tail. Weave tail through sc of Rd 77, pull tightly and secure. Weave in ends. This pattern is an original pattern and is © by Christjan Bee (May 2018). Please do not claim this pattern as your own. If you wish to share this pattern, you may link to this pattern but please do not reprint it on your site. You may keep a copy for your own personal use, but you may not sell or distribute it, or sell items made from this pattern.